Do you want to enjoy fresh juice anytime and anywhere? Our Rechargeable Portable Blender Citrus Juicers can satisfy all your imagination. This citrus juicer is also the best gift for your friends, great ideal for home or traveling. 2. Put fruit pieces into Juice Blender, about 30%- 60% of the cup, after the addition of water, the total volume lower than 80% of the bottle..
1.Do not freeze, Do not use in microwave or dishwasher. 3.Do not use the citrus juicer when it is charging. 4.Keep the charging pot from water and do not use chlorine bleach while cleaning. 5.Keep blender dry if you don’t use it for a long time. 6.When clean and wipe dry the blade, please avoid injury. Imported High-Power Motor: smash food quickly and release all nutrition. Stainless Steel Stirring Blade: sharp, durable and no rust; Multi-Silicone Anti-Leakage Ring: high and low temperature resistant. 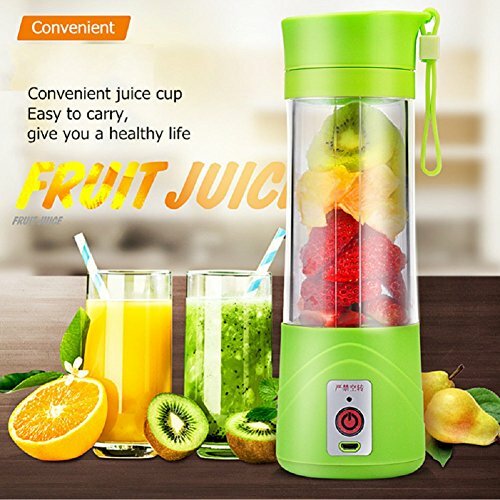 Powerful Functions: this personal size blenders can make smoothies, juice, and baby supplementary food, this centrifugal Juicer is also a cup, so it can be used to drink water. Unique Carrying Rope Design: portable, practical, made of silicone material, durable pull constantly. More Convenient: electric portable juicer has mini body and USB rechargeable batteries, so you can take it to any where you want and enjoy your fruit juice anytime and anywhere.